Brand valuation is being redefined by the Brand Investment & Valuation Project, formed in 2010 to establish “generally accepted brand investment & valuation standards.” The first phase of the project brought together leading academics, marketing and finance practitioners from six blue-chip corporations, and specialists from several research companies to identify a cornerstone brand strength metric and validate a practical model for brand valuation. Build bridges from customer metrics to market metrics to financial metrics … empirically. 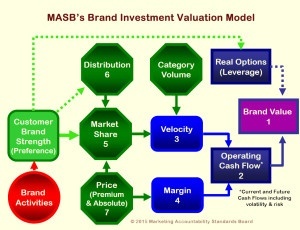 Empirically proven model for brand valuation & guiding investment decisions. During an 18-month tracking study of 120 brands, participants provided unit sales, pricing, and distribution data for their own and competing brands within their chosen categories. Three of the participants also provided brand awareness and attitude data from their proprietary brand tracking systems. While each tracking system included category specific measures, seven common classes were found across at least four of the categories; unaided awareness, aided awareness, advocacy, loyalty, purchase intent, relevance, and value. Brand preference was chosen as the total brand strength metric for a variety of reasons, the most important being that it has undergone the rigorous Marketing Metric Audit Protocol. Brand Strength (Brand Preference/Choice) drives Market Share (r=.88), and the relationship is even stronger when Price and Distribution are taken into account (from r=.88 to r=.93 to r=.94). Market Share drives Velocity (the flow of money into the business) and when paired with Margin, determines Operating Cash Flow (the amount of cash the brand returns to the organization, net of costs). Using a net present value calculation for future cash flows, results in overall Brand Value. There are also opportunities for leveraging brand strength across categories and countries. Real Options are those types of strategic considerations where a brand could move from a shampoo to a conditioner and from North America to Europe. Even though it currently doesn’t enjoy those cash flows, there is value associated with it. MASB is continuing its brand valuation modeling with BIV Project Phase II, extending the model to drivers of brand preference/choice.